How did you originally get interested in writing your book about relevance? In the summer of 2015, we hosted two exhibitions at the MAH (my museum) at the same time: one about the birth of surfing, one about the Grateful Dead. On the surface, both projects were highly relevant to our local community in Santa Cruz, but the surf exhibition blew the Grateful Dead exhibition away. They both had high attendance, but the emotional resonance and community impact was very different. I could see the difference in locals’ response, but I didn’t have a way to clearly measure, explain, or diagnose what was happening. I wanted to learn more about what was going on from experts and other practitioners around the world. And while these exhibitions were catalytic in getting the project started, in truth, I’ve been on a quest relevance for years. Five years ago, I started working at the MAH at a time of radical transformation. We turned around the institution, greatly expanded and diversified our audience, increased community connections… and disappointed some longtime participants along the way. Five years into this work, I wanted to dive in and really understand why we did this, why it matters, and why it frustrates some people. What’s one of your favorite examples of relevance from the book? I was genuinely surprised and provoked by Odyssey Works, a theater company that creates immersive experiences for an audience of one. It sounds so impractical and ridiculous. But fundamentally, making work relevant is about really understanding the people you seek to engage—what they are open to, where they want to go—and then unlocking doors to deeper meaning and new surprises on that path. It’s easy to get hung up thinking about the complexities of being relevant to multi-faceted communities of hundreds or thousands of people. By focusing on an audience of one, Odyssey Works provides an extreme example of what it means to focus on the humans in communities rather than groups as abstractions. How has being the Director of MAH changed your views of relevance? One of the big things I learned from this book project is compassion for insiders. I’ve led the MAH as a champion for inclusion of people who have historically been outsiders to museum experiences—people who don’t know that a museum might be relevant to their lives. I always thought, naively, that inclusion is for everyone. I thought that people who were against inclusive practices were elitist, classist, or ungenerous. But that’s not the full story. If you are an insider to a place or an experience, and then someone comes in and changes that experience to let in a whole bunch of new people with different expectations, that is threatening. It’s dislocating. The change can be a real loss for insiders. It doesn’t mean insiders are elitist if they don’t like the changes. I spent my first few years as the director of MAH trying to win over insiders and writing off the ones who rejected our new ways of engaging new people with art and history. I didn’t spend enough time being compassionate to insiders’ feelings of disruption and loss. I still stand by the work we did and continue to do to make the MAH a place that matters more to diverse people in our community. But I now better understand the tradeoffs and tensions involved when navigating relevance to insiders and outsiders. Similar question --- how has becoming a parent changed your views of relevance? Becoming a parent made me freshly aware of how situational relevance is. The activities that are relevant to me now are different than those that were relevant three years ago. I don’t think I’ve fundamentally changed, but my priorities, needs, and constraints have changed. And that changes the choices—especially recreational choices—I make. Sometimes, nonprofit workers get so organizationally focused that we forget that people decide what’s relevant to them in their context, not ours. Becoming a parent reminded me of the extent to which externalities (like kids) dictate what we deem relevant to us. Why do you think it is so difficult for many museums and cultural institutions to be relevant in their communities? I think many people who work in cultural organizations are focused internally. We spend our days working with our colleagues, in our offices, in our walls. We spend our nights out in the community—and we consider that time to be off the clock. We need to flip this mentality to be more relevant. Not necessarily spending all our work time out of the office (though it helps), but spending as much work time as possible talking to and collaborating with and learning about the interests and values of our diverse communities. You bring up the idea of “insiders” and “outsiders” in your book. How do you think about finding balance between those (often) competing constituencies? I think it depends on the institution. A young institution needs to cultivate insiders. You need to build a cohort of supporters and participants to whom you are relevant. An institution that is thriving with insiders can do so for as long as they like—maybe forever. But if the institution is not thriving—if insiders are opting out or moving away or are not the desired insiders—you need to cultivate outsiders. You need to invite them in. These constituencies are fluid. Every insider was once an outsider. There are insiders of every age, gender, sexual orientation, class, race, and religion. The primary difference is that insiders are in the know and outsiders are not. Sometimes, ignoring outsiders is a good thing. It encourages focus. It helps create a unique institutional personality. It can be ok. The thing that is not ok in my book is pretending to invite in outsiders while reassuring insiders that nothing will change. Maybe nothing will change—to the frustration of outsiders and their allies. Or maybe things are changing—to the confusion of insiders. I think we have to be honest and courageous when we make decisions about who to cultivate and why. What are some additional books or online resources about relevance that influenced your thinking while writing your book? Deirdre Wilson and Dan Sperber’s paper Relevance Theory was essential as a research grounding for the book. Michelle Hensley wrote a beautiful book about Ten Thousand Things theater, All the Lights On, which is a fabulous resource about their innovative process for making theater for nontraditional audiences. Relatedly, Cornerstone Theater has an excellent guide to their process of co-creating theater with nontraditional audiences. These two theaters are both amazing for very different reasons. The story of the Glenbow Museum and the Blackfoot people came to me from Bob Janes, who shared Gerry Conaty’s wonderful book on the topic, We are Coming Home. The book is available for free online. It is a riveting story of repatriation and intercultural dialogue. Lynn Pasquarella’s essay “The Ketchup’s in the Bag and the Check is in the Mail: The Humanities and Social Justice” awakened me to the specific challenges that academics in the humanities are grappling with in the age of STEM and STEAM. I ultimately decided not to include academic examples in the book because the relevance of the education system is a book in itself, but I found it very interesting. Online, the Visitors of Color blog, Betty Reid Soskind’s blog, and several religious blogs were helpful to me. I became completely fascinated with the intersection between religious institutions and cultural organizations when writing this book, and I treasured every blog post I read about pastors and rabbis working to establish relevance in their communities. Also, I’ll note that I did more extensive fact-checking on this book than I did on The Participatory Museum. I had incredible, intense conversations with almost everyone in the book about their experiences and how they interpret the meaning of their work. What do you hope people get from reading (and acting on!) the ideas in your book? Most of all, I hope people enjoy reading the book. I freely admit that this book is less of a “mission” book for me than The Participatory Museum. It felt more like an exploration than a thesis, and that allowed me to focus on making the writing as clear and appealing as possible. People often say The Participatory Museum is “readable.” I hope and think that The Art of Relevance is a lot more so. For that reason, I hope people share the book with friends and family beyond their professional worlds. 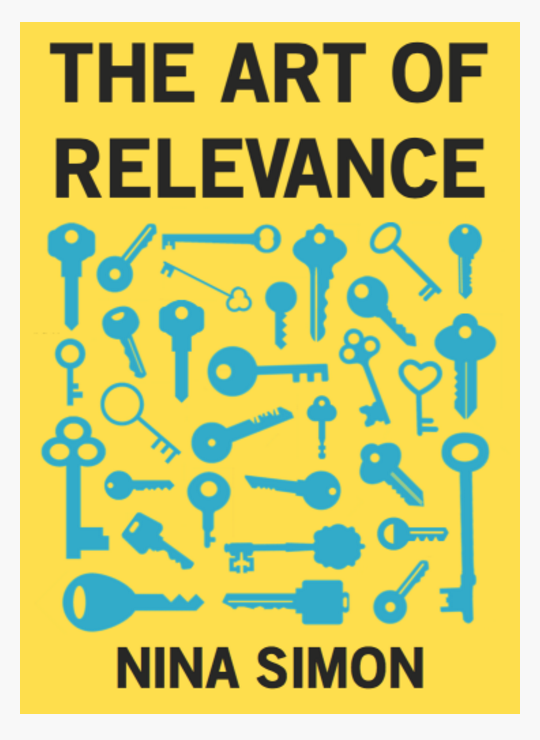 I believe that the quest for relevance is as useful personally as it is professionally. I would love to have conversations with readers about how you see these ideas applying to your community beyond your institution. Finally, I hope that readers will use this book as an opportunity for dialogue and action on how and why our work can be meaningful, delightful, and powerful for our diverse communities. I believe there are a million ways to make our work more relevant to more people. It is our challenge—and our glorious opportunity—to do so. Thanks again to Nina for sharing her thoughts here on the ExhibiTricks blog. To find out more about The Art of Relevance, or to purchase a copy, click on over to The Art of Relevance website. 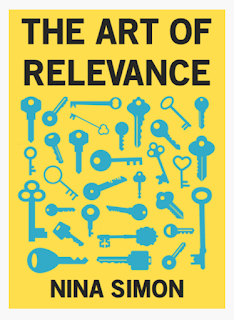 AND if you'd like a chance to win a FREE copy of Nina's new book, The Art of Relevance, all you have to do is post a comment about how you are working at your institution or organization to be relevant. Post your thoughts in the Comments Section at the ExhibiTricks blog site. We will randomly choose one of the commenters on July 30th and mail them their book. Good luck!